Our warmest wishes go to Joanna Witos one of our senior physiotherapists on her recent marriage. Jo has worked at the Centre for over 8 years but left us last September to return to Poland (although you wouldn’t have noticed as she has come back to provide holiday relief at least twice). 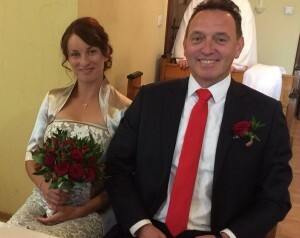 However on 24 September this year she and Marek Tukiendorf tied the knot and she has now settled in Opole in Southern Poland, where Marek is Rector (principal) of Politechnika Opolska. But don’t worry! We won’t let her go that easily — like Arnie, we’re sure “she’ll be back”!